previous post: Are our pollies lining their own nest? Today, the right-wing media that we are blessed with have wheeled out another one of their favourite little hobby-horses which they repeatedly use to promote the deregulation of the wages system. They are attacking the Government’s roll-back of Work Choices, which is aimed at restoring appropriate wages and conditions for non-standard work. In this specific case, two opinion columnists from the two major publishing houses are claiming that the Government is undermining the future employment prospects of our youth. Well if they had anything new to add by way of evidence it would be good for debate. As it is they both merely recite the dogma from the latest OECD report Jobs for Youth: Australia – and I don’t need to remind readers that that organisation has form. Its reputation in the area of labour market research is somewhat dubious after a series of recants over the last few years when confronted with solid evidence to the contrary. Anyway, here we go again. In the Sydney Morning Herald, Gerard Henderson wrote that Labor must not ignore youth jobs. Henderson is a former conservative government advisor and Director of the Sydney Institute. That organisation had, until she resigned in disgrace after being found guilty of illegal behaviour, had that James Hardie woman on its board of directors. An august institution one might say. Coincidently, in The Australian, the increasingly strident Michael Stutchbury also reiterates the findings of the OECD report in his article Penalty strike on jobs. The OECD Report correctly notes that a “key priority for the coming months should be to avoid the build-up of a large pool of youth at risk of becoming long-term unemployed.” I would, of-course, add that avoiding any large pool of long-term unemployment is essential, but not likely, given current policy. Although education and training policies are central elements of any long-term effective strategy for improving youth labour market prospects, a comprehensive policy framework has to pay attention to the opportunities and constraints on the labour market. It must pay particular attention to the labour market arrangements and institutions and their impact on the demand for young people, particularly those with no or limited education or lacking labour market experience. The conservative journalists choose (obviously) to focus on that Chapter. Some context first. The OECD Jobs Study agenda was the blueprint for labour market deregulation since the early 1990s and underpinned the pernicious welfare-to-work policies that the previous federal regime introduced. The OECD has also been constantly pressuring governments to abandon the hard-won labour protections which provide job security and fair pay and working conditions for citizens. The Work Choices legislation in Australia exemplified our obedience to the neo-liberal deregulation push. But unfortunately for the conservatives, the Australian electorate hated it, and, more than anything, it cost the previous lot their tenure in office. Care should be taken to avoid discouraging bargaining at the workplace level and pricing low-skilled youth out of entry-level jobs … [and in the context of individual contracts] … increased the labour market competitiveness of low-skilled youth. Henderson restates the obvious fact that during a recession the deterioration in labour market conditions impact disproportionately on teenagers. In summarising the Report he noted that the youth labour market has improved broadly in line with the better overall labour market conditions since the 1991 recession. He quotes the OECD which again states the obvious that “youth labour market problems were principally concentrated on low-educated, disengaged or indigenous youth”. They might have also added older workers; females; workers of ethnic origin, the disabled, the indigenous per se – to round of the groups that suffer disproportionate damage in a recession and are the last in the queue when the growth returns. When employment growth is insufficient, as it has been for thirty or more years (see graph below), then the most disadvantaged workers are always shuffled to the back of the queue. That is why the Government has to ensure there are enough jobs available to match the labour force to prevent this insidious disadvantage being entrenched. Henderson then notes that unemployment is on the rise again (quoting him) – “primarily due to international economic events”. So he is acknowledging that the dynamics are global and not related in this instance to local policy changes. Note the OECD say likely. If you read the Report and I do not recommend it – it is not worth the money – you will find that this is “likely” claim is meagre assertion. There is no hard research and analysis done at all to justify the statement. It is merely rehearsing the usual line that legislating for appropriate pay and working conditions will amount to “pricing low-skilled youth out of entry-level jobs”. I will reflect upon later in the blog. Henderson also concludes that “There is only a limited amount the Government can do to limit the impact of the recession. But it can avoid introducing laws that discourages employment.” Well this is plainly a falsehood, unless you want to run the line as Henderson has relentlessly in the past that the public sector cannot create jobs and the only jobs worth creating are in the private sector. The Federal Government via direct job creation can do a lot about minimising the direct impact of recession. His central argument focuses on the “Fast Food Industry Award” that will come in sometime next year. This is the industry that delivers products which are primarily responsible for the obesity epidemic in Australia. Readers might want to examine this Report from the South Australian Parliament. It is noteworthy that the “Fast Food Industry” refused to participate in the Inquiry that is the subject of the Report. Anyway, hardly a high quality industry. This would reverse the labour market liberalisation that allowed the jobless rate for those aged under 25 to fall to three-decade lows of 8.7 percent by the end of the latest boom. As the OECD notes, Howard’s individual work contracts – or Australian Workplace Agreements – are “likely to have increased the labour market competitiveness of low-skilled youth”. So Stutchbury also decides to quote the likely assertion to give authority to his point. But he doesn’t tell you that the OECD provides no evidence, no research for this assertion. In fact, this is just free-market ideology (religion) being pushed. But moreover, the cause and effect here is being mangled. There is no credible evidence available that shows that Howard’s so-called labour market liberalisation was responsible for faster employment growth overall or specifically among the 15-24 year olds. There is better evidence available that shows that the boom in spending (aggregate demand) fostered the growth in employment (and the decline in unemployment) with “all boats rising in the high tide”. See graphs later in this blog. Further, the evidence points to the conclusion that the “liberalisation” initiatives just suppressed the conditions that workers enjoyed and redistributed profits towards capital. In fact, there is strong evidence tha tthe suppression of real wages growth relative to labour productivity growth was a major underlying cause of the current economic crisis and thus represented an unsustainable growth strategey. See my blog – The origins of the economic crisis for a thorough analysis of this point. The priority should be to retain the flexibility that allows young people to get a foothold in the job market. Most young Australians get their first job while at high school or university, often through the sort of evening and weekend casual work provided by fast food businesses. Some disparage such jobs as dead-end hamburger-flipping. Yet the OECD says casual and part-time work in Australia is typically a “stepping stone” to better-paid careers. Moreover, the frequent resort to part-time work does not mean that Australian uni students graduate any later. And what about the evidence for the “stepping stone” claim? There is not much at all. Human capital (HC) theory, a central pillar of neo-classical microeconomics since the 1960s, argues that the outcomes of education and training are embodied in the individual influencing both labour market participation and productivity differences. Wage differentials then relate to the investment decisions made by individuals about their own capacity development. Closely linked is job search theory, which constructs job search behaviour as the activity of individuals who are deemed to be rational, maximising agents. Accordingly, any labour market participation, including unemployment and casual work, is considered a productive activity in the context of expanding the information required for individuals to make career advancement. According to this view, the search for work involves the worker continually testing the market for his/her real value which generates a feedback loop whereby the market information and the workers perception of her real value (embodied in the reservation wage) interact to condition the decision making. Search involves time. HC theory suggests that job search is triggered by the prospect of finding a job or – in case of on-the-job search – finding a better one. HC and job search theory constructs a notion of poorly paid and precarious casual work as being a paid vehicle for individuals to gain work experience and information necessary to improve their career prospects. In this context, job search (whether from a state of unemployment or within a casual job) is an investment activity which provides the person with the opportunity to escape from the bottom of the labour market. HC theory also suggests that variations in the non-pecuniary characteristics of employment provide market signals which compel the employer to offer extra pay to compensate workers for the bad job characteristics. Precarious casual employment, other things equal should be rewarded more fully than secure employment. Neo-classical time-use theory also suggests that workers trade-off various competing activities to maximise their real incomes. In this context, casual employment is seen as being of benefit to both employers and employees because it allows increased flexibility to combine work and family commitments. However, the empirical reality would seem to contradict the orthodox construction of casual employment as being a path to better things. First, entrenched casual employment for many is a vicious cycle of disadvantage. Casual workers receive reduced entitlements, inferior training opportunities, poor working conditions (diminished quality of occupational health and safety) and become trapped. The idea that poor work conditions are compensated for by higher pay does not accord with the reality of the labour market (Watson, 2004). Further, the studies that find favourable transitions from casual work link the work to full-time study. The trick is that the students who work part-time in the Fast Foods Industry while studying do get jobs when they enter the labour market on a full-time basis. But they become engineers or doctors or whatever it is that they studied for. The favourable transition is due to the avantages that a superior level of education brings and is not related to their casual work. I have done a fair bit of work on this question over the years. Recently we found that (a) highly casualised industries trap casual workers in casual employment as predicted by dual labour market theory; (b) larger firms provide greater social networks for casual workers to transit to non-casual employment; (c) unfavourable local labour market conditions do not appear to intensify the role of signalling in hiring decisions; (d) employment rich metropolitan labour markets enhance the transition rate towards non-casual employment; and (e) once we control for non-individual factors, individual characteristics have little influence on the transition rate. Anyway, to put this in perspective, the OECD (and Henderson and Stutchbury) would prefer the “market” decide on the entry level pay rates. In a sophisticated society, the community through its government and related institutions should decide those things upon the basis of what it wants the minimum entry level standard of living to be. Then firms have to adapt to that and if they cannot offer employment at those rates then they should not be in business. The market will drive wages down always – in a race to the bottom. The dynamics introduced during the so-called market liberalisation period were all “low pay and low productivity” and provided no incentives for workers to invest in productive skill augmentation nor firms to invest in high productivity capital. As a so-called clever society it was (and is) a very dumb route to follow. Over the last 20 years or so, many academic studies sought to establish the empirical veracity of the orthodox view that unemployment rose when real wages and workplace protections increased. This has been a particularly European and English obsession. There has been a bevy of research material coming out of the OECD itself, the European Central Bank and various national agencies, in addition to academic studies. The overwhelming conclusion to be drawn from this literature is that there is no conclusion. These various econometric studies, which have constructed their analyses in ways that are most favourable to finding the null that the orthodox line of reasoning is valid, provide no consensus view as Baker et al (2004) show convincingly. These conclusions from the OECD in 2006 confounds those who have relied on its previous work including the Jobs Study, to push through harsh labour market reforms, such as the Work Choices legislation; retrenched welfare entitlements; and attacks on the trade unions (for example, the ABCC). It makes a mockery of the arguments that minimum wage increases and comprehensive employment protection will undermine the employment prospects of the least skilled workers. OECD (2006) did find that unfair dismissal laws and related employment protection do not impact on the level of unemployment but merely redistribute it towards the most disadvantated – including the youth who have not yet developed skills and have little work experience. But this point is obvious. In my own work (references are available on request) I have consistently pointed this point out. In a job-rationed economy, supply-side characteristics will always serve to only shuffle the queue. But you cannot say that the unfair dismissal laws and related employment protection have caused the unemployment! The problem is that there are not enough jobs as the following graph shows. 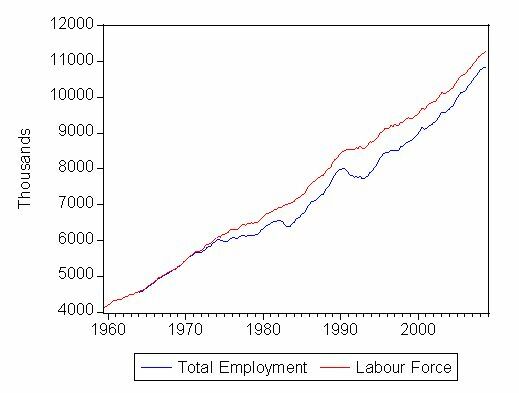 This is the relationship between the labour force and total employment since 1959. The difference between the lines is total unemployment. The diagram also understates the degree of slack in the labour market because it doesn’t consider full-time equivalent employment. Given the massive rise in underemployment over the last 20 years or so, the “full-time equivalent” or “hours” gap is about twice that shown. Further the improvement in the youth labour market over the last 18 years or so has been driven by macroeconomic forces. The following graph shows the scatter plot between the national unemployment rate and the 15-19 unemployment rate (left hand panel) and the national unemployment rate and the 15-24 unemployment rate (right hand panel) from 1978 (first quarter) to 2009 (first quarter). The R2 shows the extent to which the horizontal and the vertical axes are related. The upper limit is one and so they are closely related – but then the graph tells you that anyway. The point is that the fall in the total unemployment rate, driven by the spending boom, has impacted on all age groups. And the relationship has not changed at all in the post-1996 period when the labour market liberalisation accelerated. A reasonable conclusion is that the liberalisation had nothing to do with the macroeconomic improvements. I also checked participation rates for 15-19 year olds and 20-24 year olds to see whether there had been a notable increase during the liberalisation period. Answer: no change in behaviour. The following table is taken from that Report – click for detailed explanatory notes (NEET is neither in education or employment). You can see that Norway’s school and labour market outperforms the OECD and the EU. The reason why the relative UR Youth/Adult is higher is because the adult rate in Norway is so low! So how can the OECD recognise that relative youth wages are “among the highest in the OECD” and unskilled youth are earning “20 percentage points above the OECD average” yet claim the same things will undermine youth in Australia? You can answer that question yourselves. One secret to their superior performance is that the Norwegian Government introduced a “youth guarantee” to combat what it considered to be worrying increases in youth joblessness. The guarantee funds extra study places in upper secondary school to maintain high retention rates. It also encompasses a fully-funded apprenticeship scheme integrated within a “training place system”, which combined assessment, advice, and training within short-term work placements while still the student was still studying. Some teenagers did not want to participate in these schemes and the Government then decided to extend the guarantee into providing jobs within regional areas for such youth. Instead of the mean-spirited Work-for-the-Dole that we subject our most disadvantaged workers to, the Norwegians are smart. They began by providing guaranteed work to the long-term unemployed (20-24 year olds) such that they work some days a week yet search for work and receive training for the remaining days. So the elephant in the room is once again – the role of the public sector. What these journalists and the OECD Report on Australia are wanting you not to ask is the following questions: Why has the Government allowed total employment to lag so badly behind the labour force for so long? Why hasn’t the Australian Government generated guaranteed jobs/study for our youth? Watson, I. (2004) ‘Contented Casuals in Inferior Jobs? Reassessing Casual Employment in Australia’, Working Paper No. 94, Australian Centre of Industrial Relations Research and Training, Sydney. I was just wondering if you have any information on how Norways is performing given the current economic crisis. Have there employment policy helped cushion the impact of international factors? Is there any data out that suggests this? I’m flabbergasted by the logic or lack thereof in the orthodox economists rhetoric. By their own admission investment will always be diverted to the cheapest factor of production. Hence, the low wages strategy will mean labour intensive rather than capital intensive production. Which can only mean productivity goes backwards and living standards must follow as well. Another little trick I have noted is the orthodox schools (neo-liberals) like to fudge the econometrics. They pull the demand elasticities for labour out of a hat and always manage to give them an absolute value larger than unity, and they miraculously pull income elasticities from another hat which conveniently enough tends to have values that are infinetely small. …and from this very poor methodology they come to the conclusion that unemployment exits because wages are too high. I’d laugh only that these clowns are destroying peoples lives. Statistics Norway reports that employment has been stable since May 2008 but unemployment is rising slowly and in January 2009 was 3.1 per cent of the labour force. They report that capacity utilisation is currently below historical averages. During the 1991 recession, while they suffered like the rest of the OECD their performances were superior and they quickly brought into play large labour-intensive capital works. When I get some current data I will report it. The following graph is up to January 2009 and tells the story well.